Travel to Northern Europe with Courtney Kelley and Kate Gagnon Osborn to learn traditional Fair Isle techniques and how to modernize them for today's fashions. 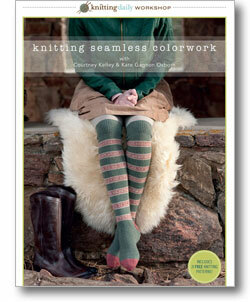 Achieve Seamless, Colorful Knits with the Newest Knitting Daily Workshop! Join fashionable, up-and-coming knitwear designers Courtney Kelley and Kate Gagnon Osborn on their new workshop video to learn to knit seamless colorwork. Learn about historical colorwork knitting, then make it work for you in modern designs. Based on traditional European techniques, Courtney and Kate's modern take on colorwork design is fresh and feminine. On their brand new Knitting Daily workshop video Knitting Seamless Colorwork, they'll walk you through the steps of various colorwork techniques based on historical knitting and prepare you to design your own seamless, colorful knits that can be worn today. Discuss traditional Fair Isle techniques and explore Fair Isle knitting in the Bristish Isles, the history of the Icelandic yoke pullover, Selbu and Bohus knitting, and more. Learn to knit projects using historical techniques, such as how to tack long floats, purling in Fair Isle, and how the choices you make can affect the overall designs. See projects for each demonstration that celebrates both the historical past of the needle arts but is classic or contemporary enough for today's fashions. Plus! You can practice your skills with three free knitting patterns by Courtney and Kate: the Frejya Pullover Sweater and Hat pattern and the Selbu Modern Beret. With a strong base in historical knitting and technical knitting techniques, and the help of Courtney and Kate's video workshop, the design world will open up new and wonderful things for you in Fair Isle knitting.